Wrinkles happen. As we age, the tone of the muscles in our face increases. This increase in tone along with a decrease in collagen metabolism results in wrinkles. Wrinkles are made worse by smoking and sun exposure. Many people are unhappy with wrinkles and try to undo the work of Mother Nature by undergoing procedures like Botox injection and injection of dermal filler. Injection of Botox (botulinum toxin) essentially works to paralyze the facial muscles and decrease their muscle tone thus temporarily smoothing wrinkles. Injection with Botox, however, is usually the first step in facial rejuvenation, and deeper wrinkles also need to be filled with dermal filler. Of note, dermal fillers are also used to give the lips, nose, jaw and other parts of the face a fuller look. The proper injection of both Botox and dermal filler require much skill and practice and preferably should be performed by a physician specialist like a dermatologist or plastic surgeon. Much like different formulations of botulinum toxin, dermal fillers also come in different iterations. Additionally, although rare, injection dermal fillers can result in adverse effects. Before you elect to have dermal filler placed, here's some stuff you should know. Not all fillers are created equal. Different fillers have different uses and are used with different types of wrinkles. Hyaluronic acid derivatives like Juvederm and Restalyne are glycosaminoglycan biopolymers and very similar to substances found in the dermis or lowest layer of skin. Hyaluronic acid derivatives are used to fill fine wrinkles and to augment or plump lips. The effect of this filler usually lasts between four and six months. In addition to resulting in very few adverse effects, hyaluronic acid derivatives are nice because excess injection can be reversed with the enzyme hyaluronidase. Calcium hydroxylapatite (Radiance FN) is a constituent of bone which can be used off label to augment soft tissue in the face including nasolabial folds (AKA smile lines or laugh lines). If injected superficially, calcium hydroxylapatite can cause lumps or nodules; hence, these fillers should be injected deeper (subdermally) into the face. 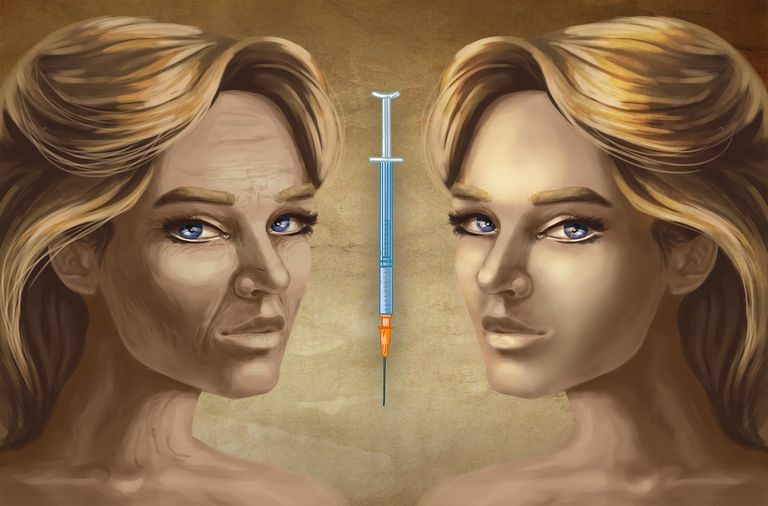 Autologous fat is fat taken from a person's own body and then injected into her face. Autologous fat is used to recontour the face and give it more volume. Although limited data exist concerning how long injection with autologous fat lasts, some think that treatment with this filler could last a lifetime. Human-derived collagen (Cosmoderm and Cosmoplast) is used to fill in facial wrinkles and plump up lips. Because this type of collagen is human, the prevalence of allergic (hypersensitivity) reactions is low. Bovine collagen (bovine means cow) is mostly used to augment lips and nasolabial folds. Examples of bovine collagen are Zyderm and Zyplast. About 3 percent of patients are allergic to bovine collagen; thus, skin testing before an application is a good idea. The effects of bovine collagen last about two to four months. Usually, adverse effects that result from dermal filler injection are mild and short-lived. However, in order to limit the occurrence of more serious adverse effects, it's imperative that the practitioner has a deep understanding of facial anatomy, injection sites, properties of different fillers and treatment of adverse effects. Allergic reactions (hypersensitivity) can occur after injection with dermal fillers because dermal fillers are foreign substances. Allergic reactions manifest as redness, swelling (edema), pain and tenderness. Sometimes allergic reactions take time to present and eventually present as painful nodules or lumps. Occasionally, dermal fillers cause severe body-wide (systemic) effects like anaphylactic shock (think dangerously low blood pressure, severe swelling, loss of consciousness, and even death). Mild allergic reactions are treated with over-the-counter pain medications (think ibuprofen or acetaminophen), antihistamines, and cold compress. Anaphylactic shock is treated in an ICU setting with resuscitative measures and medications like pressors which raise blood pressure. Any time the skin is broken, pathogens like bacteria can make their way into the body and cause infection. Infection results in redness, inflammation, pain and more. Most often infections secondary to the injection of dermal fillers can be treated with antibiotics. More severe infections that result in abscesses may need surgical drainage. Nodules and granulomas are lumps and bumps that result from infection, allergic reactions, immune reactions or excess filler. Treatment of nodules is tricky and depends on the cause. Possible treatments include massage, compresses, hyaluronidase, antibiotics, steroids, laser and chemotherapeutic agents like 5-fluorouracil and allopurinol. When filler is accidentally injected into a blood vessel, vascular occlusion or blockage can occur. Vascular occlusion by dermal filler results in extreme pain and changes in skin color. Vascular occlusion is particularly scary when it involves the injection of dermal filler into an artery as compared with injection of dermal filler a vein. Arterial occlusion results in tissue degradation, skin necrosis (death) and ischemia or decreased circulation. Rarely, when dermal filler is injected into arteries around the eye, a clot (embolus) can be thrown which occludes the retinal artery resulting in blindness. Arterial occlusion with dermal filler is a medical emergency that requires prompt recognition and treatment. Treatments for vascular occlusion vary depending on the type of filler used, location of injection and concomitant infection; these treatments can include massage, anticoagulants, injection of saline, injection of hyaluronidase and thrombolysis. Although injection of dermal filler into the face may seem simple, it's not. Without proper training, a clinician can do serious damage using a syringe loaded with filler. Because treatment with dermal filler is nuanced, it's probably best to have a dermatologist or plastic surgeon do the procedure even if other health care providers (internists, family medicine physicians, and nurse practitioners) offer this service at a lower price. De Boulle, K. and Hey, I. "Patient Factors Influencing Dermal Filler Complications: Prevention, Assessment, and Treatment." Clinical, Cosmetic, and Investigational Dermatology. 2015. Funt, D. and Pavicic, T. "Dermal Fillers in Aesthetics: An Overview of Adverse Events and Treatment Approaches." Plastic Surgical Nursing. 2015. Shah AR, Wise JB, Constantinides M. "Facial Fillers & Implants." CURRENT Diagnosis & Treatment in Otolaryngology—Head & Neck Surgery, 3e. Lalwani AK. eds. New York, NY: McGraw-Hill; 2012.